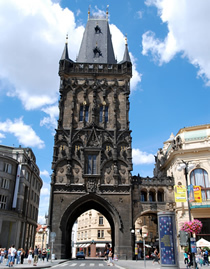 The Powder Tower (Prašná brána) can trace its origins back to the 11th century, when the original gate tower was one of 13 entrances to Prague's Old Town. Work on the present structure began during the reign of King Vladislav II in 1475 and was modelled on the Old Town Bridge Tower, built a century earlier. Originally known as the New Tower, its name was changed to the Powder Tower in the 18th century to reflect that fact that from around 1715 onwards it was used to store gunpowder. Today, the Powder Tower houses an exhibition entitled "Prague Towers" and photos by Ladislav Sitensky. Visitors can climb the 186 steps inside the tower to reach the viewing platform at 44m, for views over the Old Town. As with other historically important towers in Prague, the Powder Tower retains an appropriately sooty look that reflects its past. It reminds us of the medieval origins of much of the layout of Prague.